I expect McCarron to be just fine on the road in College Station. He's been here before many times. Normally, this is the point in the week where I start to pick four or five games I really like for the upcoming college week. I am putting that on the shelf because I really couldn’t live with myself if I didn’t pay special attention to the biggest game of the college football season taking place Saturday afternoon in College Station. Nick Saban and his Alabama Crimson Tide have had this game circled on their calendars since the Aggies and Johnny Manziel upset them in Tuscaloosa last fall. Bama is currently listed as an eight-point favorite even though the game is being played in Texas. The Tide enters 1-0 on the season with their win coming against Virginia Tech (35-10) in a game much closer than the final score. Texas A&M enters at 2-0 with two home victories against Rice (52-31) and Sam Houston State (65-28). Heisman Trophy winner Manziel will not be speaking to the media this week per sources at the University and that’s probably a good idea. I would recommend they also de-activate his Twitter account as well. Much like Alabama, the scores are a bit misleading for the Aggies. In both games, Aggie opponents were within 10 points of them in the second half. While Rice is a decent team, and that’s being nice, SHSU should not be running for 240 yards on a team in the top 10 and that’s exactly what they did. Saban will point the Tide to victory in College Station. Saban has made it very clear the importance of this game to his players. He’s had last year’s game running on a loop throughout the football facility and has the A&M logo plastered throughout the weight room. You would think that knowing the Crimson Tide got the last laugh by winning the national title that this game wouldn’t mean as much to them but that isn’t how Saban operates. Tide QB A.J. McCarron will play well especially since he is coming off a very pedestrian performance in the opener. I have to believe T.J. Yeldon will see plenty of touches against an Aggies’ defense that is giving up an average of 273 yards per game. 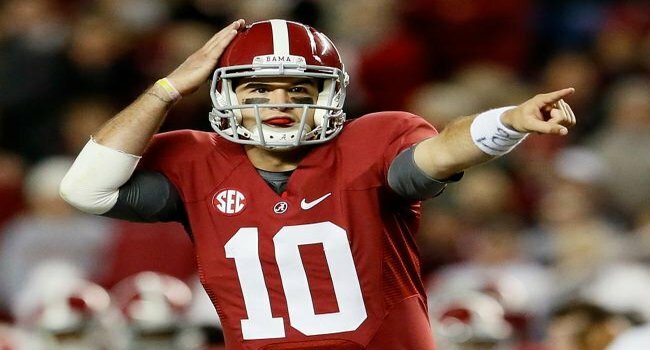 His running will set up McCarron in the play-action passing game where he will thrive. I expect Manziel to make plays. You don’t win the Heisman and not do that on a regular basis. Saban will have other ideas however entering this game. He admitted they weren’t properly prepared to play the Aggies last year on the defensive side of the ball and he won’t make that mistake again. This defense has arguably more talent than last year’s squad and has been licking its chops at the chance to get Manziel again. Saban is 8-4 against the spread when he has time to prepare for an opponent while at Bama. Bama is 16-8 ATS in road games in which Saban and company are favored. The Aggies are 9-9-1 as home underdogs over the last 10 seasons. Both teams are 5-0 straight up in their last five games. The Aggies are 6-1 at home straight up in their last seven home games. In eight seasons at Alabama, LSU and Auburn are the only teams to defeat Saban more than once. The atmosphere will be electric. There are already fans outside of Kyle Stadium trying to get the last remaining tickets and I’m guessing the RV’s are already lining up to get in prime parking position. Texas A&M is very talented offensively and will pose problems for the Bama defense with both the run and the pass. The difference in this game however is the Bama offense against the A&M defense. I can’t help but think the Crimson Tide will pound the ball at will and will wear down the Aggies and keep Manziel off the field at the same time. This environment will be nothing new for Alabama and they will thrive once both teams settle down in the first quarter. Look for Alabama to cover the spread en route to a big win on the road.